About this object An 11-term Member of the the House of Representatives, Galusha Grow of Pennsylvania served as Speaker of the House for one Congress. 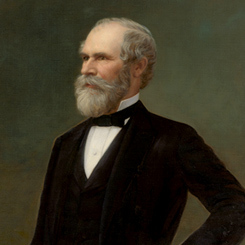 As Speaker, he lost re-election to the House in 1862, but returned 30 years later. On this date, Pennsylvania Representative Galusha A. Grow became the only Speaker of the House of Representatives elected to that position on Independence Day. After President Abraham Lincoln convened a special session of the 37th Congress (1861–1863) to address the secession of the southern states and the expansion of the Union Army, Grow prevailed against a crowded field of 14 candidates only after Francis Blair of Missouri threw his votes to the Pennsylvanian. In his acceptance speech, the new Speaker evoked the first call for independence in 1776. “Fourscore years ago fifty-six bold merchants, farmers, lawyers, and mechanics, the representatives of a few feeble colonists, scattered along the Atlantic sea-board, met in convention to found a new empire, based on the inalienable rights of man,” Grow intoned. “On the return of this glorious anniversary, after a period but little exceeding that of the allotted lifetime of a man, the people’s Representatives are convened . . . to deliberate upon the means of preserving the Government under whose benign influence . . . grand results have been achieved.” The Congressional Globe noted “vociferous applause" during Grow’s remarks. Following a period of sectional deadlock in the House throughout the 1850s, the 37th Congress—with a membership comprised entirely of Northern and border state Members following the secession of the Southern states—passed an impressive list of legislation in the mere 34 days before adjourning its first session on August 6th. This busy first session saw the passage of laws of great importance in the early days of the Civil War: among them an act to authorize a National Loan to help cover the cost of the war, and the first Confiscation Act, which formalized General (later Representative) Benjamin Butler’s policy of treating runaway slaves as “contraband,” freeing them once they reached Union lines.